I’ll always remember my first trip to the fertility doctor. My husband, Ryan, and I sat awkwardly in a waiting room, listening to the Backstreet Boys greatest hits through the ceiling speaker, while avoiding eye contact with other couples and commenting on the unusual art: mermaid family statue. The sculpture was of a mommy and daddy mermaid holding up a baby mermaid in the air! The artwork and music choice created a nice comedic relief from the anxiety of wondering what the doctor would say. What would be my prognosis? What if she said I had no chances of carrying a baby to term? What if there were no answers for why I easily became pregnant but could never stay pregnant? The rollercoaster of three pregnancies, followed by three miscarriages, was a ride we were ready to get off. The nurse eventually called us back to a consultation room that had all the posters and props of a high school health class, where we nervously played on our phones until the doctor finally came in the room. She sat down, looked through my medical history paperwork, and in no more than five minutes told us what she thought was wrong and how she planned to fix it. She confidently assured us she was not worried about my eventually carrying full term. We left the doctor’s office feeling very assured and encouraged. 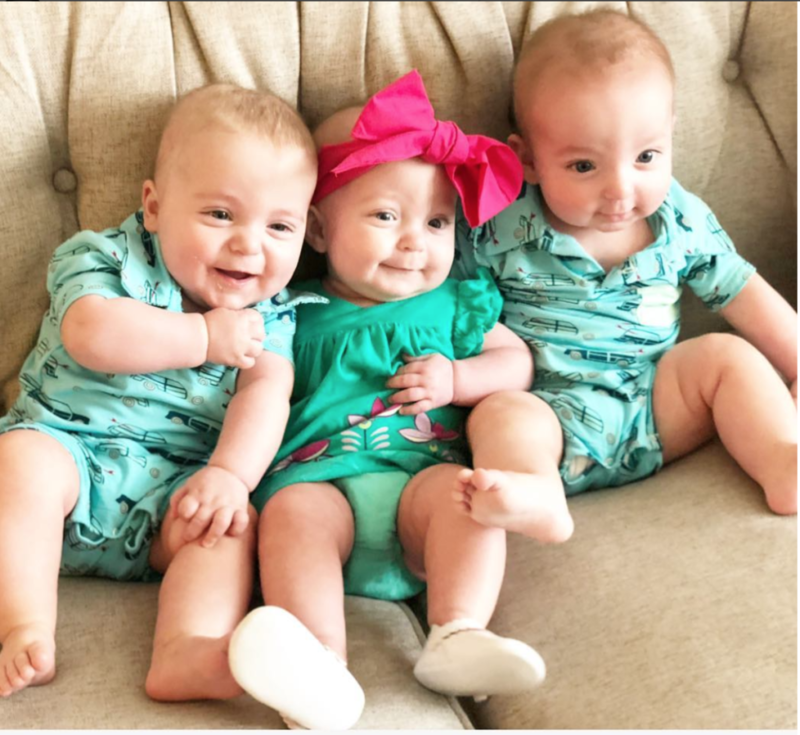 With the doctor’s help and God’s choosing to answer our heartfelt prayers for multiples, our triplets Blair, Barrett, and Blake were conceived six months later. We do not believe our triplets were a result of fertility medication. However, God chose to use medication to help bring about our desire for a family, and maybe He wants to do the same in your life. After going public about our miscarriages and triplet pregnancy, the questions and comments started pouring in from women struggling with the same heartache of infertility and the same dream of conceiving. “Your story has encouraged me to not give up on my dreams of being a mom” one woman wrote to me. “As a Christian, how did you justify seeing a fertility doctor?” was a question sent to me by another woman who honestly wondered the spiritual argument for seeking help. How did we justify seeing a fertility doctor? Is seeing a fertility doctor playing God? Are babies born with fertility help any less miraculous? How do I talk to my spouse about going to a fertility doctor? How do I keep enjoying life with fertility struggles? How Did We Justify A Fertility Doctor? Last October, I kept getting the flu, even with the flu shot. No matter what I did, it seemed like I kept getting sick and I kept being out of commission for weeks. I didn’t pray about what I should do. I didn’t ask respected leaders in the church their counsel. I was sick, and I needed a doctor. The same is true for people who are continuing to experience fertility problems. Does A Fertility Doctor Play God? God opens and closes the womb. Simple as that. Does God need help? No. Does God use modern medicine to help correct issues in our imperfect bodies? Yes. No baby is born outside of God’s will. God doesn’t have to readjust his plans for the world when a baby is born via fertility treatment. God is more powerful than fertility medication, and I can tell you from experience that receiving fertility treatment does not ensure a baby is born. For as many couples who receive children from medical help, just as many have failed-attempt stories. We are not powerful enough to trick, outsmart, or out-medicate God. Are Babies Born With Fertility Help Any Less Miraculous? We get asked all the time if the triplets were “natural,” most often by the checkout ladies at Target. We specifically prayed for three biological children, for multiples, and for “God to do more than anything we can hope or imagine” (Ephesians 3:20-21) and God answered. The fact that God answered so specifically and so creatively is nothing short of miraculous. God either opens the womb or He doesn’t. Whether a child is conceived through the help of science, medication, a memory lapse in taking birth control pills, or carefully timed family planning; every child is a miracle worthy to be celebrated. The reason God sometimes uses medical intervention is something we will have to ask Him when we get to Heaven. Every life conceived is equally valuable. Every answered prayer for a child is worthy of praise to our Lord. How Do I Talk To My Spouse About Seeing A Fertility Doctor? Be sensitive, be humble, be open, and be loving when talking to your spouse about seeking help. We can all admit fertility is an awkward topic. Saying “fertility doctor” always makes me think of the monkey Rafiki from The Lion King. The idea of talking to a stranger about fertility issues can seem invasive, embarrassing, and weird. From my experience, fertility doctors often have an honorary degree in sensitivity training. I was amazed at their ability to talk about bodily functions while keeping a straight face, but they do it! The doctor’s appointment likely won’t be as bad as you imagine it to be. Even if the appointment is as bad as you have imagined, with the alternative being childlessness, it may be an awkward appointment worth scheduling. Please don’t write off fertility doctors and treatment as too expensive before researching your options. You would be amazed at the different options and programs for fertility treatment! Lastly and most importantly, decide ahead of time that your fertility struggle is no one’s “fault” but is the path God has destined you to journey together. How Can I Enjoy Life Through Our Infertility Struggle? God has a plan for your life that is not contingent on your ability to become pregnant. God gives us what we need. It is a tough pill to swallow, but by that rationale if you don’t have a baby then it’s not what you need right now. I know that is hard. I know that is heartbreaking. I also know that my worst year personally was my best year spiritually and in ministry. There is something different God has planned for this time, regardless of how determined you may be that it’s baby time. Please don’t get so consumed with ovulation tests, pregnancy tests, baby apps, baby clothes sites, or even reading pregnancy blogs that you miss what God has for you today. I do not know what is right for your family. I do know too many couples are struggling in silence with fertility problems, and too many women are repeatedly experiencing heartache, while medical solutions are often available. Let us take advantage of living in an age where modern medicine can help accomplish our dreams of a family. Let us remember that we serve a God who can do more than anything we can hope or imagine.